Although the utility of this idea is a little questionable, who wouldn't be stunned by a pair of beaded shoes. What's more, chuck in a brogue style and you've got yourself a pair of crowd wooing kicks. 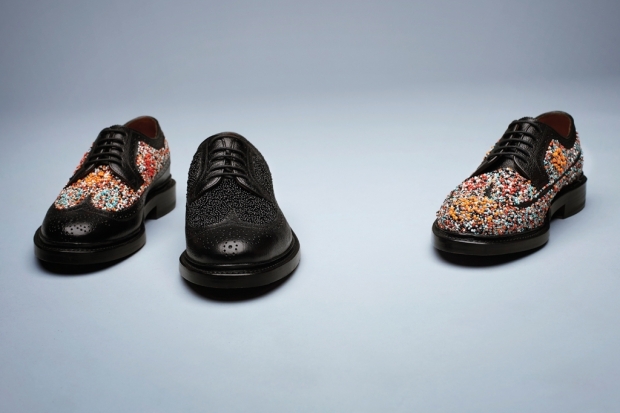 Florshiem and Duckie Brown have teamed up to make a collection of just that, beaded brogues. You may need some serious sartorial game to pull these off, but either way these shoes are something of a whole new level. Perhaps adding to the debate of art vs fashion, the shoes aren't for the faint of hearted but I think we can all admit they've tickled everyone's fancy. Check out the teaser snap below, good luck tracking down a pair.